With this iExpression you can make a 3D property react on a beat which you created using one of the beat detector iExpressions. When there is no beat the property has its normal value given by the keyframes as if no iExpression would be applied. 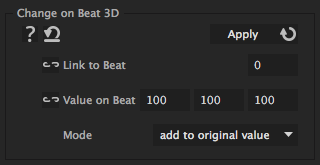 When there is a beat, the value changes to what you specify in "Value on Beat" (or the "Value on Beat" is added to the current value, if "Mode" is set to "add to original value").